Sir Albert Abdullah David Sassoon, 1st Baronet KCB CSI, (25 July 1818 – 24 October 1896) was a British Indian businessman and philanthropist. Sassoon was born on 25 July 1818 in Baghdad into the Sassoon family. He was educated in India. After his father's death, he served as head of his families merchant company "David Sassoon & Sons" (Later called "David Sassoon & Co."). Under Albert Sassoons leadership "David Sassoon & Sons" established in 1874 in Bombay a new subsidiary, the "Sassoon Spinning and Weaving Company", which opened serval cotton mills there. In 1875 the company built the Sassoon Docks, the first wet docks in Bombay. The company was also instrumental in the founding of the Imperial Bank of Persia in 1889. After a visit to England in 1873 Albert Sassoon settled there permanently in 1875 to direct "David Sassoon & Sons" from London. The management of the companies affairs in Bombay was left to his younger Brother Solomon David Sassoon (1841–1894). Albert Sassoon died in Brighton in 1896, aged 78 and was buried in the Sassoon Mausoleum, which he had built in Brighton (England). In 1933 his body was removed and reburied in the Willesden Jewish Cemetery in London. He was a major benefactor to the city of Bombay. Among his gifts was a significant contribution towards the reconstruction of the Elphinstone High School and the erection of a large equestrian statue of the Prince of Wales, Albert Edward, commemorating his visit to India in 1875. He also financed many scholarships and became a close adviser to the government on educational and building projects. David Sassoon donated Rs. 60,000, while the Government of Bombay Presidency bore the remainder of the cost of Rs. 65,000, for the construction of the David Sassoon Library and Reading Room on Rampart Row, Kala Ghoda in Bombay. Its construction was completed in 1870, and like many buildings in the vicinity such as Elphinstone College, Army and Navy Buildings and Watson's Hotel, it was built using yellow Malad stone. The entrance portico bears his white stone bust. The Dr. Bhau Daji Lad Museum, formerly The Victoria and Albert Museum, was built with the patronage of many wealthy Indian businessmen and philanthropists including Albert Sassoon, Sir Jamsetjee Jejeebhoy and Jaganath Shunkerseth. In 1866 Sassoon was made a Companion of the Order of the Star of India (CSI), and in 1872 a Knight Companion of the Order of the Bath (KCB). Around the same time he received "Order of Lion and Sun" from Shah of Persia for "work in Persia and his services in development of Persian commerce". During his visit to England in 1873 he received the freedom of the city of London. After Alber Sassoon had settled in England he was created Baronet Sassoon in 1890. Albert Sassoon married Hannah Meyer Moise (1823–1895) in 1838. They had six children. The eldest son was Edward Sassoon (1856–1912), who in tern was the father of Philip Sassoon (1888–1939) and Sybil Cholmondeley, Marchioness of Cholmondeley (1894–1989). Albert Sassoons father, David Sassoon (1792–1864), was a leading Baghdad merchant and a treasurer under Ahmet Pasha, the Governor of Baghdad. 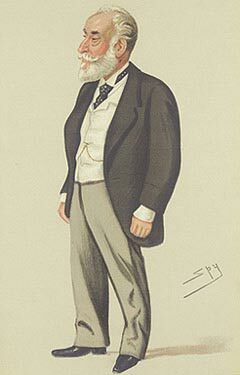 However, he fled after he was implicated in a corruption scandal, moving from Baghdad to Bushire, in Iran, and finally settled in Bombay (now Mumbai) in 1832, where he founded a large mercantile business, called "Davis Sassoon & Sons". Albert Sassoons great-great-great-grandson is the actor Jack Huston. ^ a b c d e One or more of the preceding sentences incorporates text from a publication now in the public domain: Chisholm, Hugh, ed. (1911). "Sassoon, Sir Albert Abdullah David" . Encyclopædia Britannica. 24 (11th ed.). Cambridge University Press. p. 227. ^ Between Foreigner and Shi'is, Daniel Tsadik, page 112, 2007, Stanford University Press. ^ "No. 26019". The London Gazette. 31 January 1890. p. 545. Wikisource has the text of the 1885–1900 Dictionary of National Biography's article about Sassoon, Albert Abdullah David. Wikimedia Commons has media related to Albert Abdullah David Sassoon. This page was last edited on 10 April 2019, at 22:18 (UTC).